China in Print is Asia’s premier international fair and exhibition for rare books, manuscripts, maps, photographs and ephemera. The three-day event is held in the spectacular location of Hong Kong Maritime Museum and gathers together some of the leading specialist dealers in the world. The fifth fair opens on 18 November, and we’ll be there. Our team of specialists is putting the finishing touches to the firm’s China in Print catalogue. 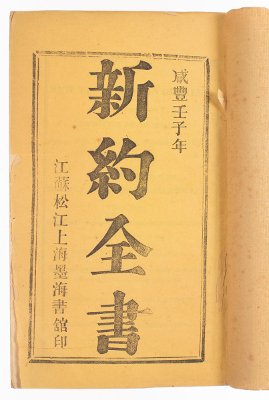 Included will be this copy of the most influential of all the nineteenth-century Bible translations issued in China, the ‘Delegates’ Version’ of the New Testament. More information about this important book can be found here. The China in Print website has a wealth of information about the fair and exhibition. Please do take a look.